I realized yesterday that I haven’t updated my blogroll in ages. The whole concept of blogrolls is slowly being erased from my brain because I rarely think about them — largely because blogrolls live on blogs and I rarely visit blogs anymore. Instead I do most of my blog browsing in my RSS reader. Out of sight, out of mind, goodbye blogrolls. But the blogroll of a well-liked blogger or a trusted information source (regardless of how well-liked) can be an extremely useful filter for finding more good content. Prolific genetics blogger, Hsien Hsien Lei, is leaving behind her blog Genetics and Health to start anew with a general interest blog Eye on DNA. Check it out! Somewhere adrift in the turbulent waters of the Noob Sea, a handful of modest vessels carrying scientists, physicians, and patients are organizing their plans for homesteading in the new frontier of online communities. 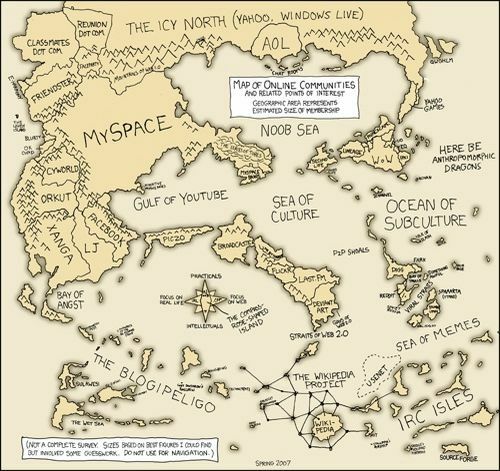 Some are charting a direct path toward the archipelago of the wikipedians and their ilk, others may meander in the Straights of Web 2.0 or the Gulf of YouTube. And there is some speculation that some vessels are destined to harbor in the Bay of Angst.